In the world of fast food social media accounts, KFC isn't necessarily the chain you turn to for pithy humor. Wendy's kind of wears the crown. Though, some of its rivals try to tussle every now and then. Yup. 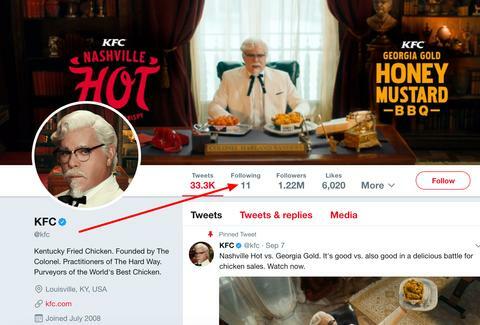 The Colonel only follows 11 people, and they're all Spice Girls or guys named Herb. Whoever did this deserves a raise. Good job, KFC social media person. Good job.